The Chasing Malaria project is trialling strategies and approaches that will be required to drive down malaria to elimination in areas of low disease incidence. The program is funded by RAM and works in the National Capital District (NCD) and Central Province where malaria rates are already low. The first component is Surveillance. RAM has designed and printed standard record books for all of the health clinics which record details of all malaria diagnostic tests including the home address and recent travel for all positive cases. These sheets also feed information into the monthly reports to the National Health Information database. The positive cases are mapped across the regions and malaria clusters are identified for follow-up. 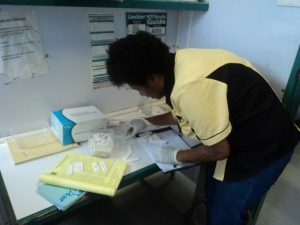 RAM works closely with the National Department of Health (NDoH) and regularly visits all the clinics to check that the record keeping is complete and accurate, to audit the Rapid Diagnostic Test kits (RDTs) that have been used and to check that all the RDTs and treatment drugs are in date. 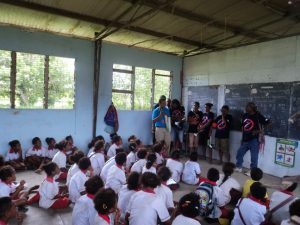 Where required, RAM supplies RDTs and Drugs to the clinics as well as bed nets. All positive cases are given a family size net and all expectant mothers also receive a new net under this program. Where malaria case clusters are identified, Ross Baibuni (RAM’s Manager of Community Based Malaria Control) and his team recruit local community health volunteers and work with the local schools to teach the students about malaria and mosquito life cycles and to search out all the mosquito breeding sites around the cluster location. Breeding sites are mapped by GPS and regularly checked. When they are active (i.e. contain mosquito larvae) specific strategies are developed to destroy the larvae. These include draining or filling, introducing fish to eat the larvae or spraying larvacide. Local households are informed of the risk and the presence and use of bed nets are checked. The pilot project is a work in progress with new and refined approaches being developed and assessed but it is already having an impact on malaria rates the local people are very supportive, understand the aspects of malaria transmission and value their bed nets.